One of the best wireless earbud options is available for $170. Whether you like it or not, true wireless earbuds are having a moment. They actually have for a while now, and Apple's introduction of AirPods only added fuel to the fire. Most of the big names in audio have introduced models, following the path Bragi forged with the Dash back in 2016. While Bluetooth issues still plague some of the current options, the devices as a whole have come a long way since their infancy. It should come as no surprise that Jabra, a company with a solid track record for Bluetooth headsets and audio gear, has one of the best, if not the best, sets with the Elite 65t. The Elite 65t avoids the common pitfalls of true wireless earbuds with great sound and enough battery life to ensure you’re not charging several times a day. If you’ve been looking to eliminate one of the last remaining cords in your life, this is definitely one of the best options. And it’s an affordable one, too. Be the first to review the Elite 65t? Before my time with the Elite 65t, the Bose SoundSport Free changed my mind about wireless earbuds. The sets I'd used before were fine, but they weren't compelling enough for me to drop my wireless over-ear headphones for a set of earbuds. The issues I encountered are common among true wireless headphones: the two buds would regularly lose connection with each other, or had super-limited range. The audio also didn't wow me. If I'm going to wear wireless earbuds to the gym, they have to have full sound, with a decent amount of bass to help me keep the energy up. Bose did that for the most part, and it was the first time I realized I should give totally wireless earbuds another shot. Enter Jabra. The company's Elite 65t are compact and nestle neatly in your ear. Unlike the SoundSport Free and AirPods, they don't stick out too far. You won't look silly, and you also don't have to worry about getting snagged taking off your warm-ups. The 65t are also comfortable, unless you wear them for a while without a break -- it's around the hour mark that the Elite 65t starts to bother me. But I haven't found earbuds yet that I could wear with absolutely no discomfort. I chalk that up to having something stuck in your ear rather than a large padded earcup encircling it. There's only so much you can do. The Elite 65t are all black, with a silver face. On both buds, there's a circular area on the outside that houses onboard controls. A small arm-like piece juts out from there, holding the set's microphones. The right bud handles play/pause and summoning Siri or Google Assistant, while the left can adjust volume (short press) and skip tracks (long press). These controls are handy, but it still means pushing them further into your ear when you press. I quickly discovered that you can hold that arm to make it slightly better. It's not a deal-breaker, but just know you're going to feel some pressure when you employ those controls. 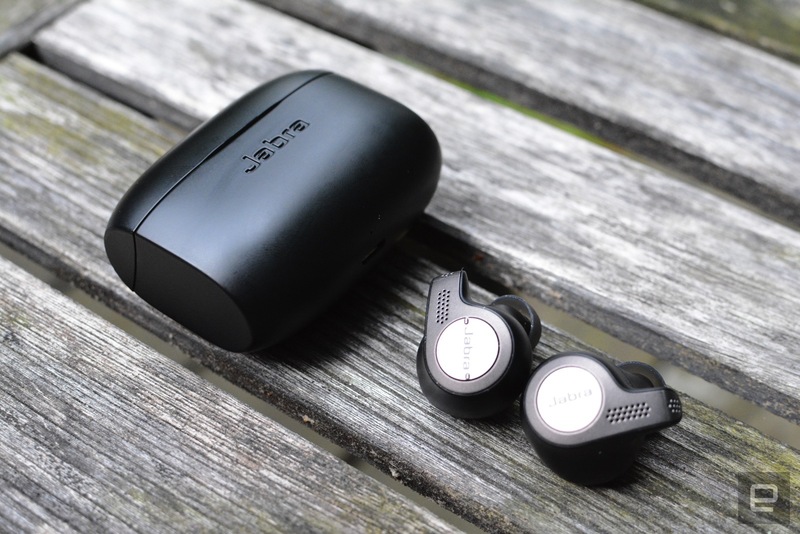 Like several other wireless earbuds and headphones, the Jabra Elite 65t will automatically pause when you remove one or both from your ears. Sure, it's a common feature, but that doesn't make it any less handy. Ditto for the included charging case. 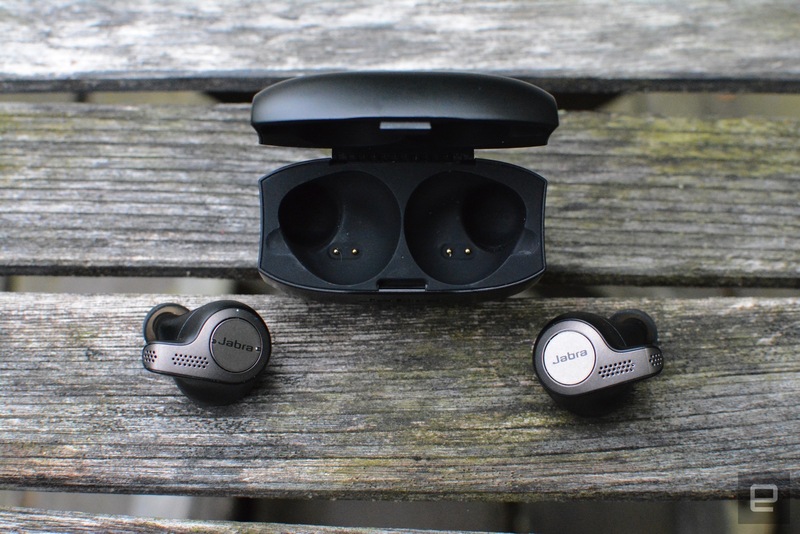 Jabra promises five hours of battery life for the earbuds and another 10 hours banked in the case, for 15 hours total. I never tested the five-hour limit, as I plopped them back in the case after each use; however, I only had to charge the whole package about once a week, and I was using them for at least a little while every day. And on gym days they got extra use, because they're dust- and sweat-resistant (IP55-rated). Basically, battery life shouldn't be a concern for you here unless you plan to wear them continuously during an eight-hour workday. As much as I liked Bose's SoundSport Free, that set had a serious bug where the audio wouldn't sync properly when I was watching video. I was concerned that the Elite 65t would have the same glitch. I'm happy to report that's not the case. With Jabra's set, I had no issues watching The Handmaid's Tale or The Looming Tower on my phone or laptop. Again, it sounds like a simple thing, but it's an issue that many totally wireless earbuds still suffer from. In terms of overall sound quality, the Elite 65t is quite good. There's a fullness to the audio here that a lot of wireless earbuds lack, with punchy highs and some deep, booming low end. While there's plenty of bass for blasting hip-hop at the gym, it isn't so much that other genres suffer. The Elite 65t performs well across a range of music, from bluegrass to metal and from synth-heavy tracks to vocal anthems. If audio quality is the primary reason you haven't made the leap to totally wireless earbuds, you're out of excuses. And, while I think these are solid out of the box, you can tweak the EQ to your tastes using the companion app if you're feeling particular. Given Jabra's experience with headsets, I expected audio during calls to at least be decent. Indeed, call quality is pretty good, unless you're in a super-noisy spot -- like a busy street -- which is the only time the person on the other end had trouble hearing me. Connectivity is the biggest concern for me when it comes to true wireless headphones like the Elite 65t. Most of the pairs I've tried either don't stay in touch with each other or have terrible Bluetooth range, so they're constantly disconnecting when you walk away from the paired device. Neither of those issues occurred during my time with the Elite 65t. Pairing for the first time was quick and easy, and every time I took them out of the case after that, the earbuds automatically connected to my phone and computer. In terms of range, I was able to walk around my three-bedroom house without losing the connection. At times, I could even venture outside, depending on where I'd left my phone. As I previously mentioned, all of the big names in audio have trotted out totally wireless earbuds by now. That list includes Sony, Bose, Samsung, B&O and many others. While some of those can cost $200 or more, Jabra's Elite 65t is $170. Sure, that's a little more than Apple's $160 AirPods, but the audio is better on Jabra's set, and they don't look like you left a pair of Q-tips sticking out of your ears. Despite the video sync issue, I still like what Bose offers with the SoundSport Free in terms of audio quality. However, those jut out of your ear quite a bit, and they cost $30 more than the Elite 65t. Combine those factors and Jabra is clearly the better pick. Jabra's Elite 65t won't wow you with flashy features, and that's okay. Headphones don't need to be flashy, especially if they sound great. They need to be comfortable, sound good and stay connected -- and Jabra checks all three boxes. What these true wireless headphones will do is give you great audio in a hassle-free package.